Before the Internet, news in Canada was gleaned from sources that enjoyed a significant level of public trust. CBC, Global and CTV competed for the loyalty of TV watchers, CBC dominated the radio, while The Globe and Mail was Canada’s national newspaper. Then, in the 1990s, things started to change. The Internet began to enter the homes of Canadians, providing an alternative to TV, radio and print. By 2017, a torrent of news—accurate and otherwise—was flowing across all media, with Canadians increasingly getting their information from the Internet, often through the filters of social media. This new media landscape affects the way Canadians think, feel and talk about the world around them. Social media contributes to a polarization of politics, according to Stuart Poyntz, associate dean of the faculty of communications at SFU. He describes the so-called “echo chamber” effect, in which custom feeds of news and information on social media are tailored to fit a user’s pre-existing opinions and beliefs. The consequences of polarization can, in some instances, be deadly. Appearing before a national defence senate committee on Feb. 6, 2017, RCMP Commissioner Bob Paulson was asked if there has been an increase in criminal extremism in Canada, such as the attack on a Quebec mosque in January 2017 that left six men dead. Paulson said that sort of extremism has not increased, but there has been an increase in polarized discussion. David Moscrop, a PhD candidate in political science at UBC, says that when people form silos of political opinion on the Internet, their views consequently intensify, and they become more susceptible to inaccurate, misleading or otherwise tainted news and information. These themes are playing out in real-time among Canadians on social media, and particularly on Facebook, which was the social network Canadians used most in 2016, according to a May 2016 poll by Insights West. There are many politically themed groups and pages on Facebook where Canadians gather to share news and discuss strong opinions. These groups often cover fringe ideas and have only a handful of participants, but some groups have thousands of members and lively discussions. Take The Republic of Western Canada, for example: a page dedicated to western separatism and home to over 26,000 members. Although the theme of the page is western separatism, people are essentially free to post and discuss anything they want. There is frequent discussion of immigration, refugees, Muslims, the shortcomings of Alberta Premier Rachel Notley and Prime Minister Justin Trudeau, among other topics. These discussions often centre around articles that have been shared to the group. Some of the articles are from mainstream news sources, such as CBC and the National Post, but some are from alternative sources. An article from conservative website The Rebel titled “Freedom To Offend: Support free speech, not sharia!” posted to the Facebook group on Feb. 7, 2017 received 32 “reactions” and 20 comments. One user, Pat Laurin, commented “Is this true?” and another user, Lois McQuinn, replied “Yes Pat Laurin the source is valid—Rebel media with Ezra Levant is one of the few Canadian media sources that we can trust.” Laurin replied, “I believe you but watching isn’t enough we need to act.” No one else questioned the veracity of the article in the comments section. Alberta, is a member of The Republic of Western Canada and sometimes participates in the discussions there. He says he no longer trusts mainstream news media in Canada, CBC in particular, and he looks for alternative sources of news and information online, some of which he finds on Facebook. Leischner says he never fully trusts a single source for information on a given topic, choosing instead to consult multiple sources before forming an opinion. Moscrop says that these sorts of extreme ideologies, such as the views expressed by Leischner, were less visible before the Internet because it was difficult for small groups to disseminate information back then. Now, he says, sites like Facebook provide a straightforward and inexpensive platform for fringe ideas, and the echo chamber effect means that these ideas can snowball once they are on social media. 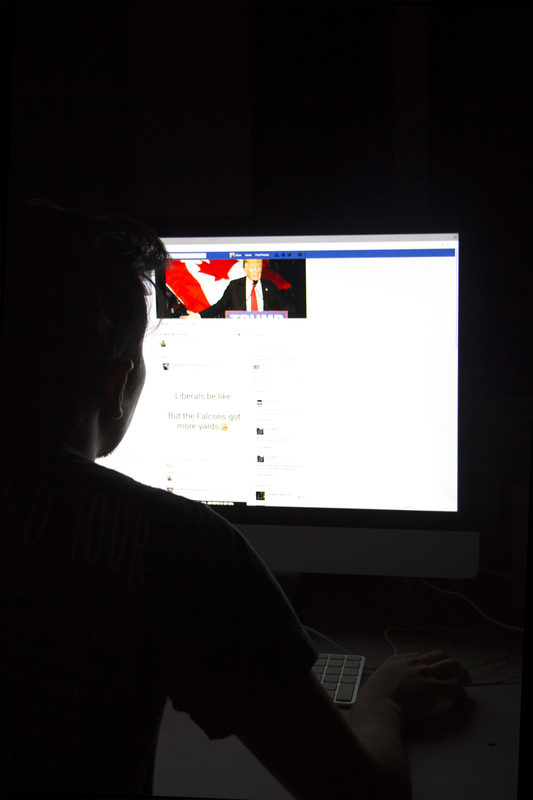 John Nesdoly created a Facebook page called Canadians For Donald Trump in March 2016—well before the now-president was being taken seriously by the mainstream media. The group had over 10,000 members by February 2017, and discussion within that page is similar to that found in The Republic of Western Canada. Nesdoly says he created the page because he felt Americans had the false impression that all Canadians are liberals, and he wanted to create a forum showcasing alternatives to that narrative. “[Americans] have this perception, down there, that Canada is a very, very ‘blue’ country […] and we’re not,” he says, adding that he believes the mainstream media contributed to that false impression, though there may be other factors as well. While Nesdoly says he doesn’t completely lack faith in mainstream Canadian news, he doesn’t trust CBC at all. He says The Rebel is his preferred news source. Canadians For Donald Trump is not totally devoid of opposing political opinions: Nesdoly’s page is sometimes visited by people from the left who leave comments, he claims, that go against the group’s norms.